Check this creative animal pop up card for new year, CNY tiger greeting card with free template and pattern to print out. It is late but since zodiac year only repeat once every twelve years and it looks cool so I will feature it just in case someone is looking for animal theme specially tiger. 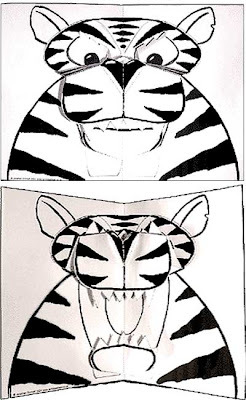 This tiger pop up card is designed by Jonathan Emmett. There are many other cards such as for birthday and so on but I'll save them for my next post. Instead of buying you can make your own board game, chess set pieces by using paper, it's free by Sheila. This is an art work that worth a praise. 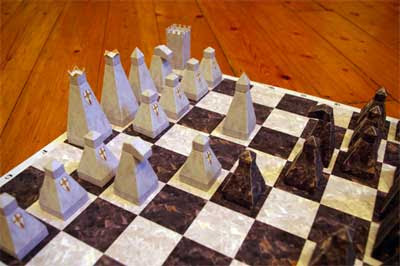 A complete set of chess pieces complete with the board. It can be used as decoration or play it as normal chess pieces. But you will need to be extra careful since it's made of papers. At sheila craft site, you will also find other cool paper model such as mediaeval trebuchet and weapons, sword, axe etc. A cute and colorful easter bunny paper box to be filled with easter eggs, free printable template by Canon Creative Park. 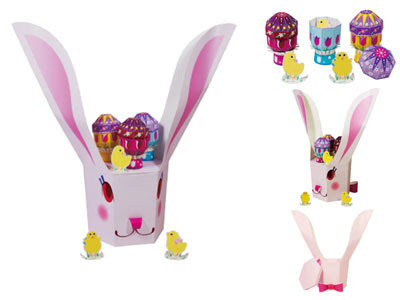 This easter bunny papercraft is a box patterned after the easter bunny special for the upcoming easter day. Just remove the top and you can fill it with eggs or anything. Another interesting part is there are chicks as accessories and they will be revealed if you break the small decoration boxes (egg shaped) into two. May be we can use them for decoration instead since they are cute. 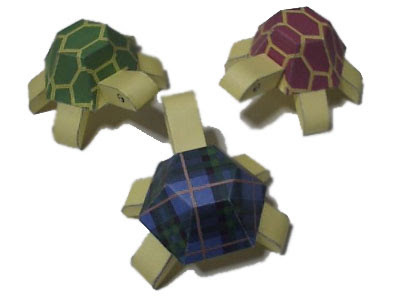 Check these turtle paper toys. They are colorful and cute. You can make them yourself with free printable templates prepared. Simply cute and easy to assemble. So I think this turtle papercraft is suitable also for kids. They come with 3 colors version of the shell; blue, red, and full white. It's suppose to has one more template for green shell turtle but the template is nowhere on the page. Well, I could not find the author name either but I think it's up for sharing. So grab them today to decorate your table. 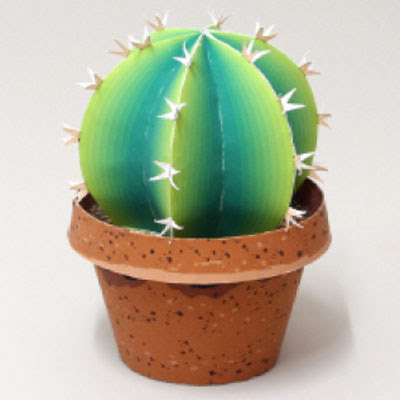 A cute cactus plant papercraft that you can make and use it to decorate your house. Free printable template and tutorial by Epson HK. People always use plants to decorate their houses. Flower made of plastic is also one of the choice but what about plant which made of paper? This cactus looks so real and the best part is it does not need water and of course at the contrary it won't grow. But it does not need any care so that's what matter the most. Since it is made by papers, it's actually pretty light and a strong wind can send it flying. So you might want to choose a right place to keep it. These paper trout look real and close to original size. 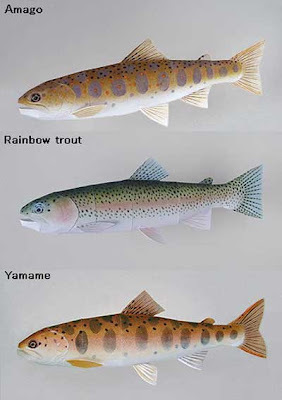 There are 17 type of trouts that you can select and make. Well, someone who loves fishing will definitely love them. Well, certain species can only be found in certain area and region and now you have a chance to collect them all. May be it's weird to call paper trout as a trophy but looking at them might ease your feeling while waiting for the trout fishing season and it will be fun to have them on the table as decoration. 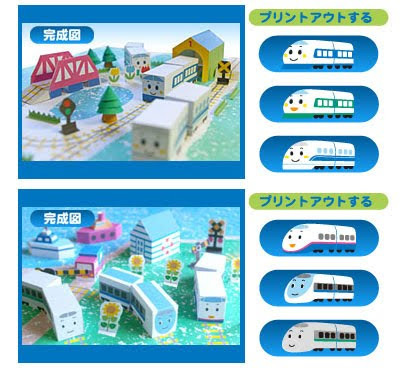 Cute paper model of trains and town buildings which are suitable for kids. Simply easy to make, free printable pdf template by Sanrio. There are 12 models that kids can choose. All the of them have smiley face, cube shape and that make them really cute. Beside the paper trains there also also building such as houses and other accessories like railroads, trees, flowers and more. All of them if placed together will make a good town scenario and assembling them can be used as group work between kids and parents. If you are interested, you can explore this site to look for more building papercraft. I have made many posts related to houses, buildings and transportation which will be a good addition to this. Some are simple and suitable for kids while half are a bit complicated and only for skilled crafter. 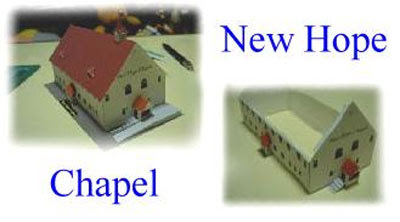 Simple 3d church or chapel papercraft for school project. Free pdf template and pattern to print out. It is named as new hope chapel. A simple model that can be used for kids school project. It looks difficult but it's actually easy to fold and assemble. The difficult part might be because of it's in japanese language. There are also some tiny parts so both patient and focus are needed when attaching them together. Kids might need some guides from adults or teachers. 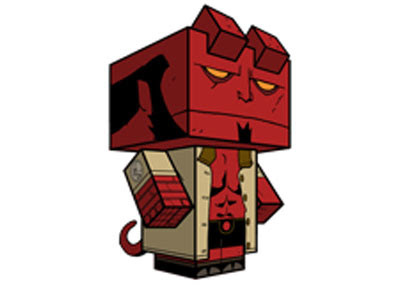 A simple yet awesome hellboy cube craft paper toy, free template to download by cubeecraft. It is Hell boy, a popular cartoon character of comic created by Mike Mignola that then was made into movies. So far only 2 movies were made and third movie is still on the making. For hell boy fans this cubeecraft might become a good fan art stuff to add into your collection. Beside this paper toy there are also other popular character such as batman, sonic etc. You may want to explore the site yourself because there are too many to list them here. There are model of popular cartoons, movies and even famous real figures. 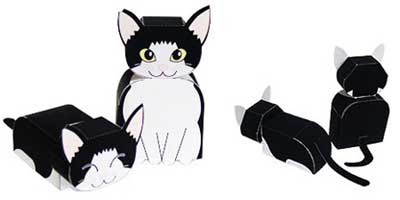 A cute cat paper toy which is easy to make even for kids. It is a beginner level paper craft with free printable template by Waka Studio. This cat is designs by Waka Studio for its animals theme papercraft. Beside this there are others like tiger, cow, pig and many more. They are actually easy to make because it consists only 2 parts. It only needs a little folding and then just attach the both parts together using a glue. As you can see, there are two figures you can choose ; the sitting and sleeping cat. So cute and adorable, hehe. Check out these high quality paper cars that you can make. 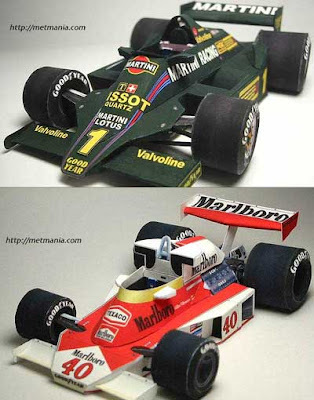 They are 1970's Formula One race car consist of Lotus, McLaren and BRABHAM series. Ok, these are designed by MetMania. On the page, there are 5 paper crafts prepared for you with free templates provided. All of them are cars made years before I was born so of course I have never seen them. But I know at least that the designs are kinda different from today's formula one. May be you know them better than me. Well, they look nice with sophisticated design and colorful. I'm happy to be able to find these great art works and share them with the readers. 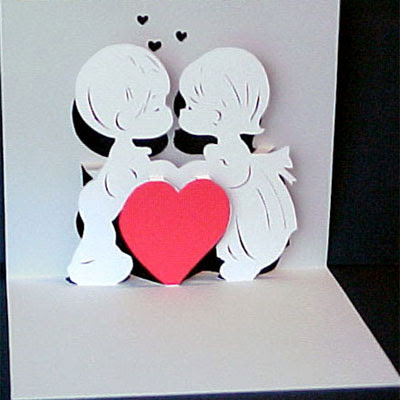 A cute pop up card pattern and design that you can download and print, special for Valentine's day. Cute right? It's actually simple to make. Just need a little patient and skilled with knife. The sample for this card is in black and white except for love shape. So if you want to show off you artistic skill, color the both kids to make it looks more attractive. As for the heart shaped, it uses color decoration paper that you can prepare by cutting it following the heart line in the template then paste it on the available heart shape of the card. Just use your imagination. then you will able produce something amazing. Kids will definitely love this. 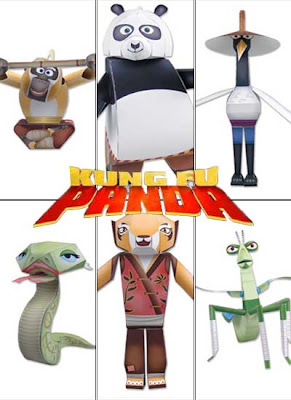 A papercraft set of popular cartoon characters; Po, the kungfu-warrior-wannabe panda and the Furious Five; Tigress, Monkey, Mantis, Viper, and Crane paper toys. There are 3 more characters ( Master Oogway, Master Shifu and Tai Long) which I wanna see in paper toy version, unfortunately Hp did not prepare any of them. 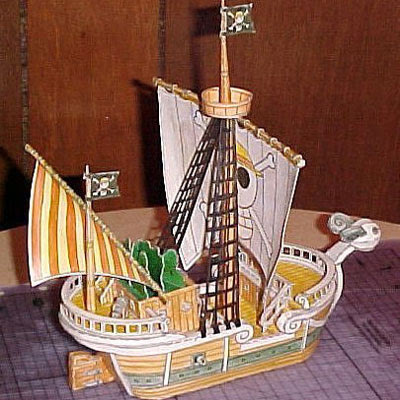 StrawHat Nakama, Going merry (Ship) papercraft for One piece fans. Free template and instruction by Ninjatoes. 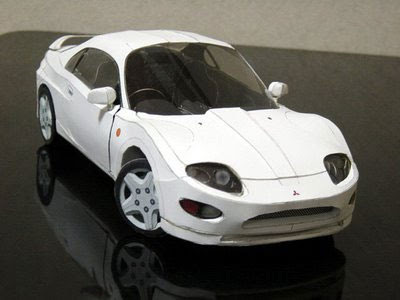 A complicated car papercraft for a skilled crafter - super detailed Misubishi FTO car paper model is up for challenge. Get your free printable templates today. Did I say for a skilled crafter? Yes because it is not for everyone. It will take lots of time and patient to get the job done. It has too many parts, very detail structures inside out. For model kit fans, why not try playing with papers for a change. This Mitsubishi car was supposed to be on display at the Mistubishi Museum in Japan a couple of years back. We're lucky to be able to get hold of the copy while the site is still alive and running. I talked about paper bag, gift box and card for valentine in previous post. 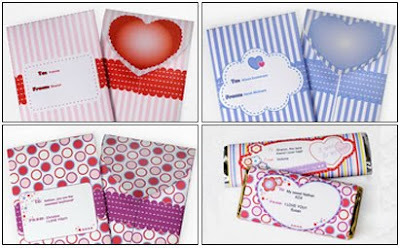 Now enjoy this valentine treat treat bag and candy wrapper, free templates also from HP website. 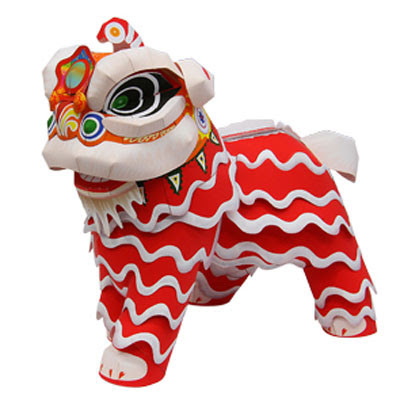 A new papercraft from Canon Creative Park, lion dance paper model for Chinese New Year theme suitable for decoration. Grab the free printable template today. Have you ever see live performance of lion dance? I can count how many times I saw them and they're fantastic. The show needs a good cooperation from the team members to display a smooth movement. The most interesting part is when they jump from a pillar to a higher one, looks dangerous. Well, they are acrobats in general so it's a piece of cake for them. Lion dance is not only be played during Chinese New Year but also in other big occasion such as wedding, business opening ceremonies etc. It is usually performed as a ceremony to exorcise evil spirits and bring good fortune. My favorite house papercraft. More than 21 house paper models with rotating calendar installed. There are free templates to download, recommended for room decoration. 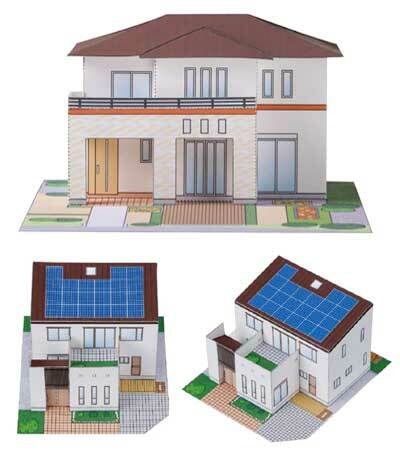 I featured 3d house papercraft in my previous post but I think it's still nothing compare to these houses. The most special part is each has calendar on it that applied for a whole year, and not only 2010 calendar but years to come. Also not forget to mention there are more than 21 of them with various colors and designs. A well made craft that I will recommend to everyone. Well, if you are not into houses like these, there are also carousel paper models on the same page which also have calendar installed. All are cute and charming! So get your printable template today. A pretty paper rose that you can make and present it as a gift for this Valentine's day. Free printable template by Canon Creative Park. 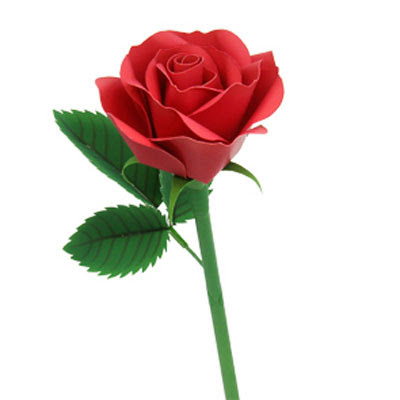 One of the popular gifts beside chocolate is rose which represents romance and love or in simple word "I love you". Different color has different meaning but red means just that, right? So enjoy this red rose flower papercraft and I wish your valentine to be great, with lots of love. 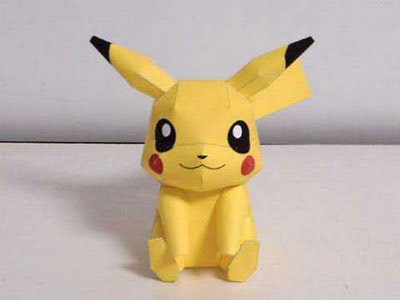 A kawaii pokemon - pikachu papercraft which you can make yourself to decorate your table. Free template and simple instruction included. Tell me who does not know pikachu, the cute yellow pokemon monster, from kids to adult everybody at least know or heard of the name. I'm not really a fan of pokemon but even so.. I think it's cute too. This pikachu was kinda popular not too long ago, and you could find it being featured at many blogs around the internet. And because the template is in japanese, I make a simple translation for the texts and upload it into my server. So check it out if you are interested on making this cute paper toy. It has been awhile since I visit the website. It's unfortunate of you because months ago there are 12 types of house but only 4 left for now. And the designs are slightly different than before. I like the old designs to be honest but i can't find them anywhere. 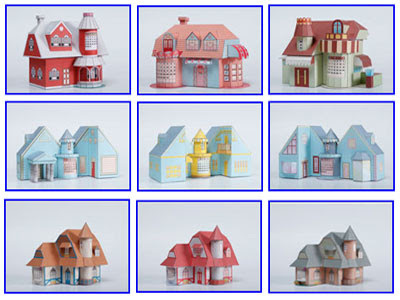 Anyway, enjoy these house paper models and I'll share you the rest from another website in my next post. 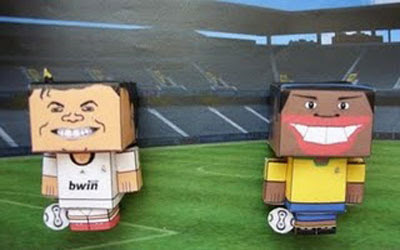 What will you think when you see your idol turned into paper toy like these? Fun isn't it, and these are not all. There are many more characters which you can find in cubeecraft version. And I think cubeecraft is the best medium because it looks abstract, artistic and cute, more like a cartoon version. And this year is a long waited year for soccer fans. Yes, because of 2010 FIFA world cup that will be held in South Africa. Which team is my favorite? Hoho, secret.. I just wish I can watch entertaining match that worthy my time to stay up late thats all. And I love watching Ronaldo and Ronaldinho football style of course. → Subscribe! Get update via email. All the papercrafts are copyright to their respective owners. Commercial uses are strictly prohibited.